Lock in a great price for Memphis Motor Inn – rated 8.1 by recent guests! We did not take breakfast. However, the family room that we occupied was value for money, well equipped and comfortable. The owner was very friendly and approachable, and offered a free upgrade. The room was recently renovated so was very clean. Would definitely return again. The bed was comfy and the air con worked really well. Owner is lovely! The staff were friendly and helpful. Bathroom was quite large. Friendly staff, a good place to relax and stay ova night or two, or three and can easily take a short drive to the city centre. Excellent stay. Good value for money, clean and great location for our needs. The shower had good pressure and was nice and hot. Memphis Motor Inn This rating is a reflection of how the property compares to the industry standard when it comes to price, facilities and services available. It's based on a self-evaluation by the property. Use this rating to help choose your stay! 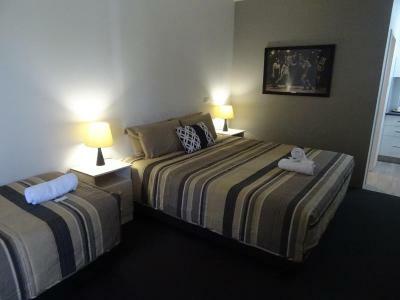 Featuring an outdoor swimming pool, Memphis Motor Inn is located in Parkes. This 3-star motel has air-conditioned rooms with a private bathroom. Free WiFi is available. At the motel, rooms come with a desk. Every room is fitted with a kettle, while some have a patio. At Memphis Motor Inn, every room includes a flat-screen TV with satellite channels. Forbes is 19 mi from the accommodations. When would you like to stay at Memphis Motor Inn? This single room has a private entrance, air conditioning and electric kettle. This double room has a electric kettle, private entrance and patio. This double room features a sofa, patio and microwave. This twin room has a electric kettle, cable TV and toaster. This family room features a private entrance, air conditioning and microwave. House Rules Memphis Motor Inn takes special requests – add in the next step! Memphis Motor Inn accepts these cards and reserves the right to temporarily hold an amount prior to arrival. Several of the upturned drinking glasses were soiled. The bathroom in room 5 is quite narrow and being pregnant, it was tight to move in there. Also, the towel rail fell down and I barely touched it. The room was very clean. The bed was extremely comfortable. The staff were exceptional. The motel was undergoing renovations so the outside appeal was not what we expected. Some of the furniture needed replacing. The motel and rooms should look good once its all finished. I Need to stand on a chair to put the Aircon on.